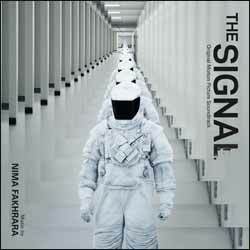 Nima Fakhrara's score for The Signal is, on the first listen through, a bit of a bland affair. But stick with it, and you'll soon be mining the layers of quality that lurk beneath the surface. For this project, Fakhrara built three instruments that became the signature sounds that pop in and out of the score. The Pagoda (which is a "tree-like" creation), the Transmission (what is like a transmit ion) and the Steel Marimba ("Marimba looking thing"). The end result is a score with a sound like no other soundtrack you'll have experienced before. And for the subject matter of the movie this is perfect. However, it takes more than a few listens to really appreciate what Fakhrara has crafted here. On occasion the tracks sound like background atmospheric tracks, and in truth a lot of them are. But for adding suspense and eeriness to the movie they do a spectacular job. The album contains 22 tracks (49 min, 37 sec) with personal highlights including the subtle and beautiful 'Goodbye'; 'I Am Sorry'; 'The End'; and '2.3.5.41'. If you're looking for an eerie, atmospheric score with a twist... you've found it.